BREAKING NEWS! J-31 has flown, see here. 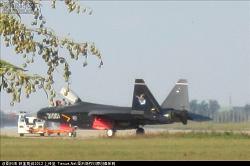 Images have emerged of a Chinese aircraft closely resembling the F-22 Raptor. 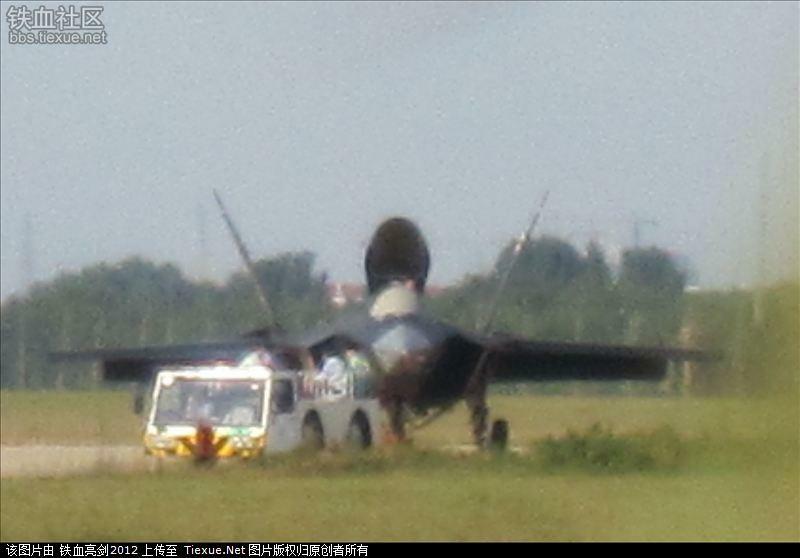 Some sources have referred to it as the Shenyang J-31 as the serial number begins ’31’. The relationship between these photos and the mystery aircraft seen on a truck in June (see Hush-Kit archives, June) is unclear, though some have dismissed the link say the two shapes are too different to be related. The aircraft appears to be smaller than the F-22, though similar in general appearance, strongly suggesting a similar role- a stealthy air dominance fighter (the designation J-21 was previously associated with an aircraft more in the F-35 class). As long time stealth-guru Bill Sweetman noted, the J-31 is appears to freed from the STOVL demands for a single engine that lead to the F-35’s configuration. This could mean a less draggy fuselage and a larger weapons bay. It is possible that whereas the F-35 is attack-optimised, the J-31 puts more emphasis on the fighter role. A noticeable difference is that the aircraft appears to have 3D vectoring nozzles, as opposed to the Raptor’s flat 2D exhausts. The smaller size may also suggest that the J-31 is the ‘lo’ to the J-20’s ‘hi’. Today the ‘Flanker’ series represent China’s high-level fighter and the J-10, their low, F-16 equivalent, fighter. Another notable feature is the twin nosewheels, possibly suggesting a carrier role for the fighter (though some land-based Chinese fighters have twin nosewheels). It is possible that China has followed the US in producing a ‘joint’ multi-service aircraft and this variant is equivalent to the F-35 ‘C’ variant. The front aspect reveals several similarities with the F-35, and is it possible that the intakes feature a divertless ‘bump’, something China has experience of from both the JF-17 and J-10B. Several reports have discussed alleged Chinese hacking of the F-35 programme, whether this relates to the J-31 is unknown. It is questionable if China has the know-how to develop the avionics which are key to both the F-35’s potential capabilities, though one wry observer noted ‘..It is also questionable as to the extent that the US can produce the F-35 systems..’. 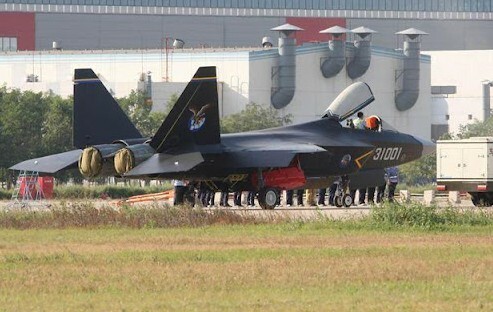 The type appears to be stealthier than J-20, and the surface finish more representative of a production stealth fighter. The type is gaudily decorated with a bird of prey design on the tail and is numbered ‘31001’. The tail design features the Chinese symbols for ‘Falcon’. A similar motif was seen on a scale model of the same basic configuration, revealed on the internet in 2011, described as the F-60 (Chinese fighters for export are prefixed with an ‘F’ designation). Whereas both the J-20 debut pictures and ‘J-21/31 truck’ pictures were initially greeted with scepticism, analysts are generally impressed by these most recent pictures, demonstrating a shift in general mood towards Chinese internet leaks. Could this be a fake? With the J-15, ‘J-20’ and ‘J-31’ in development, China has more nascent fighter projects than any other nation, and has eclipsed Russia as the ‘call and response’ counter to US projects. The ‘stealth club’ currently has one member,the US, but it is clear that China and Russia are likely to join at some point in the future. If the aircraft sighted is a prototype, then it would be reasonable to expect frontline aircraft by 2022. The lag between initial flying prototype and squadron aircraft in the West is generally no less than 9 years. Though we do not know if the sighted aircraft is more akin to the YF-22 or the first F-22. The first flew in YF-22 form 1990, followed by the first F-22 1997, and squadron service in 2005. It is even possible, but unlikely, that this is close to production standard. China tends to move faster than the West, with the J-10 taking around 7 years from likely first flight (1998) to service entry (2005). Clearly the ‘J-31’ is far more ambitious than the J-10 (or J-10B) and the timescale is likely to be longer. The political motives for the very public transportation of a fighter shape on a truck in June and the recent images is unknown, but on the anniversary of the invasion of the disputed Diaoyu islands, Japan is on the mind of many in Chinese government, and anti-Japanese sentiments are increasingly vocal. Could this publicity be a response to Japan’s selection of the F-35? Even more likely, considering the time this project was originated, is the possibility that this is a response to Japan’s earlier intentions to acquire the F-22 Raptor, an effort quashed by US export regulations. Another factor in the timing of the unveiling must be the forthcoming visit by US Defense Secretary Panetta, some observers noting the similar debuting of the J-20 when Robert Gates visited China in 2011. I looked at the Wikipedia entry for this, http://en.wikipedia.org/wiki/Shenyang_F60, which states it is reportedly powered by Klimov RD-33 engines. I find that hard to believe somehow, as Shenyang, the reported manufacturers of the aircraft, due to their logo being on the fins, would use anything other than a derivative of the Saturn AL-31 series. This engine powers both the J-11 and J-15, both of which are produced by Shenyang. Also I think that the size of the aircraft also lends weight to the AL-31. Lastly, of course, is the fact that if the J-31 does have three axis vectoring engine nozzles, this is something which is already available to the Chinese via their Suhkois and their ‘licence-built’ derivatives! This is obvouisly a domestic show rather than an international show. After the Deng’s taking over of the government,the Chinese leaders had never done any constructive things to their defense system.All those nuclear weapons and the space programes are all the relics of the Chairman Mao’s contributions which were once deplored by Deng and his supporters ,and had once caused the disputes between Mao and his rivals on wether China should develop nuclear and space programs at the expenses of having all the USSR assistances being withdrawed and getting the western power’s boycut.The current Chinese leaders,most of whom are Deng’s followers,dare not to do anything which is contributive to defense the country’s interests internationally ,especially against the superpowers.Just like sending the naval vessal to capture the pirates in Africa,the disclosures of the developing aircrafts are merely the domestic show to improve the government image by telling the people that they are doing something .But ,in the millitary point of view, what a stupid thing it is to show off the projects when they are still in the developing stage.I don’t think they want to tell the enemy what kind of weapons they are equiped.The only purpose is to boast to the people and to lie to themselves that they are strong enough.For those people who have the basic millitary knowleges will only be convinced that a government really want to protect its country and its people is to show its muscle against those who are occupying our territories and offending our basic right and dignity. Not surprising that the Chinese possibly hacked Lockheed Martin for JSF blueprints, yet the Russians were more tactful in their T-50 design. During the Cold War it was in the Soviets best interest to out do the competition of U.S. firepower!